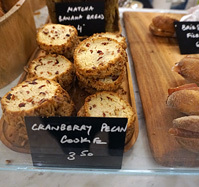 Tartinery now has an open-air cafe in Grand Central Terminal. Known for its tartines, or open-face sandwiches, diners can expect to find varieties like creamy burrata with roasted tomatoes and thyme, and roast beef with pecorino, arugula and Truffle mayo. Soups, toasts (including smashed avocado), salads (including beet & goat cheese), and an assortment of croissants, cookies and other sweet treats are also available along with juices, smoothies and coffee drinks.